Unlike classroom-based training, eLearning has one big limitation: Instructors and learners are separated, often by time, distance or a combination of both. Designing custom eLearning content under these circumstances is a challenge. Ultimately, being effective is all about the learning objectives that you need to achieve. Here are some best practices that you can use to help you customize your content and make your eLearning courses more effective. Before you start, understand what it is that the course needs to accomplish. Is it to on-board new hires? Do you want to enhance on-the-job performance? Are learners being helped to remember and recall new policies and procedures? Everything you do from this point onwards, in terms of building your eLearning content, must focus on achieving those objectives. The client, or the course sponsor, is the one who will help you set those objectives. A detailed discussion with the relevant party is likely your first order of business. You could do this by interviewing or polling prospective learners, or by questioning/interviewing the course sponsors. A deeper understanding of your audience will help you frame your content in a way that will be highly engaging and effective for them. For instance, new hires may need content that walks them through the basics, whereas enhancing skills of seasoned staff might need more advanced, hands-on type of content. In order to customize the content you are developing, you need to make sure you are delivering content that is truly useful, and not just spinning out material that learners are already familiar with. Once you nail down your learning objectives, take time to ascertain gaps between current skills or knowledge levels, and the desired outcomes. Then, focus on bridging those gaps with appropriate content, exercises and quizzes. Regardless of how well you think you know who your audience is, and what it is they are looking to learn, it is absolutely crucial to contextualize the objective to specific cognitive outcomes. Use Bloom’s Taxonomy to help you accomplish this. For instance, if hands-on application (Applying) is the desired level of cognition, then produce content that will help your learners enhance on-the-job performance, as opposed to producing content that helps with recalling (Remembering) a series of processes or procedures. Make sure the assessment techniques used to customize your content match the learning objectives. In the above example, where job performance improvement is the objective, using fill-in-the-blanks (FIBs), or Multiple Choice questions (MCQs), might not be a good idea. Instead, use of case studies and role playing exercises might better help assess learning absorption and polish job-related skills. Each learning objective can best be served by a specific content delivery approach. Selecting how you deliver the content will determine your effectiveness at accomplishing your learning objectives. For instance, scenario-based delivery might be excellent for compliance training, while a simulation might be a better strategy for shop-floor skills enhancement. 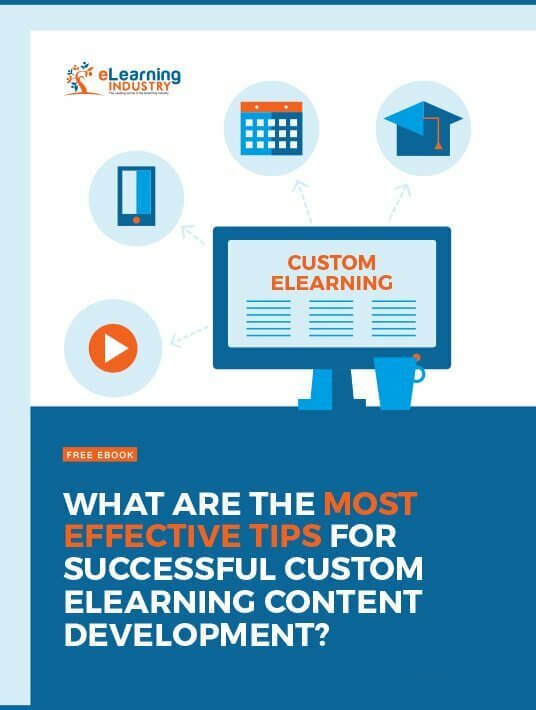 Following these tips and best practices, will ensure that your eLearning content is customized to deliver exactly what your learners need.